Supreme Air provides Air Conditioning, Heating and Plumbing Services, Repair, Installation, Maintenance, and Tune Up in Severn, MD and surrounding areas. Upon arrival I spoke with customer and him and he didnâ€™t have a problem with furnace, only wanted to get system inspected. He and Donna spoke and it was agreed that for $99 I would inspect his furnace. Capacitor in spec, flame sensor a little dirty but correct spec, ignitor in spec. Inspected heat exchanger, good. Blower clean. Filter has decent amount of dust, customer may want to consider duct cleaning. Ran furnace and found normal heat rise and amp draw. System operating normal. On arrival checked thermostat was calling for cooling. Measured EWP,LWP,EWT,LWT. measured return and supply temperature, amps, voltage, inspected electrical connections, blower wheel is clean, evaporator coil is clean, used a vacuum to clean condensate line, and replaced filter provided by customer Aprilaire 413. Customer is moving out. Unit is operating normal at this time. Upon arrival I found furnace firing up then flame shuts off due to low flame sense. Quoted customer to replace but he declined for now. 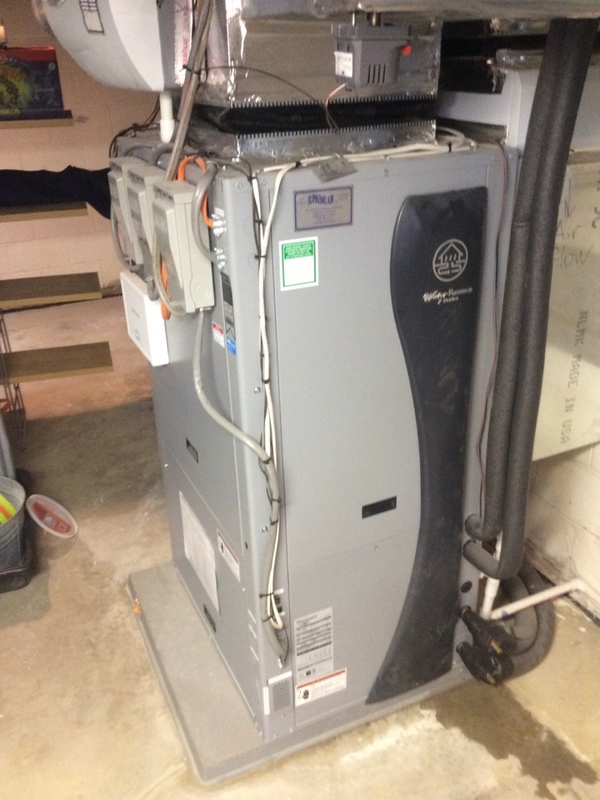 He may be considering replacing soon, furnace and ac 14+ years old. Fall pm on 02/11/19 On arrival set units to call for heat measured supply and return air temp measured voltage and amps inspected electrical connections checked drain and cleaned checked filters unit operating normal at this time. On arrival checked thermostat was calling for heat, inspected EWP,LWP,EWT,LWT, electrical connections, voltage, AMPS, and also replace filte(size413). Unit is operating normal. Fall pm on 02/01/19 On arrival set units to call for heat measured supply and return air temp measured voltage and amps inspected electrical connections checked drain and cleaned checked filters and replaced unit operating normal at this time. Furnace is in the basement with the exhaust going out of the back of them home . Leak is on the first floor ceiling under the washer . Would need to cut ceiling open to find problem . Costumer needs to talk to property owner . Fall pm on 12/06/18 On arrival set unit to call for heat measured supply and return air temp measured voltage and amps inspected electrical connections checked drain and cleaned checked filters recommended to install UV lights unit operating normal at this time. The compressor voltage absorption system (run capacitor) was rated for 30 and had a value of 8.36. Therefore the compressor could not start or run. Customer had turned the heat off last night, otherwise the auxiliary heat would have kicked on. I made sure the auxiliary heat strips did operate. I replaced the part with a 30uf single run capacitor with a start value of 30.35. I cycled the unit to make sure it would operate and checked the temperature rise: 25.4 degrees in second stage heat mode, which is within comfort range and units specifications. Unit operating normal. I retained the depleted capacitor to return to Water Furnace. I also spoke with the customer about the Intellistart modules. Completed tune up . Gave costumer quote to check humidifier and also to level out her outdoor unit . Also there is a sensor fault coming up on thermostat . System is operating properly , would have to run service to figure out issue . Costumer paid in cash . Took a picture of it and will turn into Jackie . 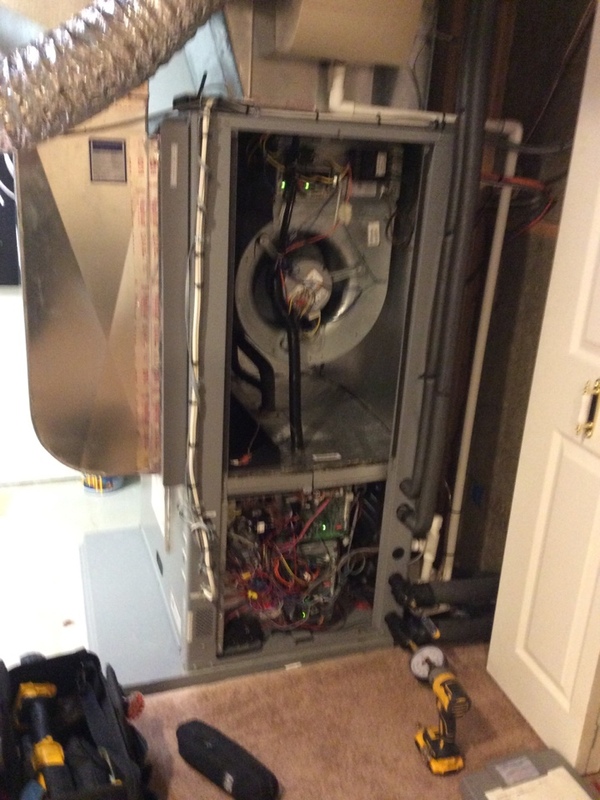 Completing routine maintenance on a Water Furnace Geothermal Heat Pump in Severn, MD.